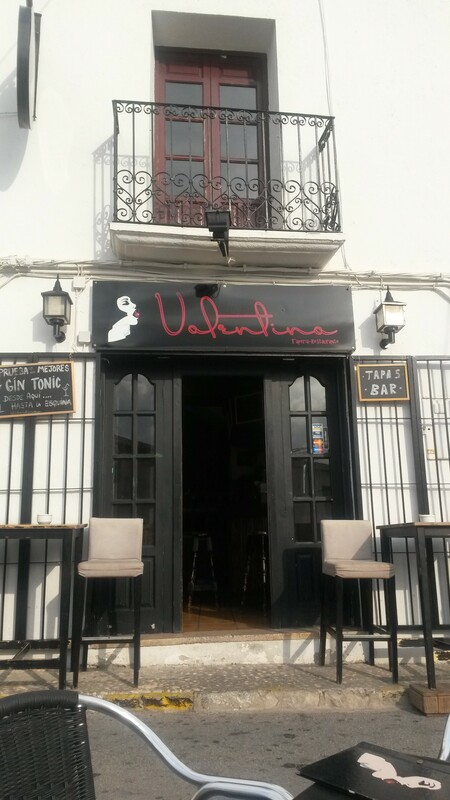 Valentina is another of my favorite tapas places where I have had interesting food forays. 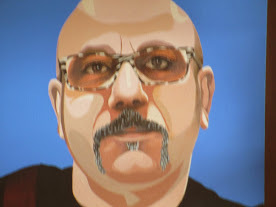 Andrea and his family hail from Puglia (Italy), but have lived here in Spain for many years. Andrea’s girlfriend, who is the chef, makes creative and delectable food. On one occasion, a darling two-year old girl repeatedly chanted, “Caracoles,” as she waited for the small snails to be prepared and served. She ate them like a pro. On several occasions, Andrea has brought me a tapa that he would not serve to everyone. One memorable tapa was something with a texture similar to tofu but with a meaty taste, saying he knew I would eat it. When I inquired as to what it was, he smiled and replied coagulated chicken blood. My son, Robbie, an executive chef in at Belcampo, a well-reviewed restaurant in Los Angeles specializing in their own humanely and sustainably raised animals, asked me to find out how it was made. On one of the occasions I ordered something from the menu I had “Milhojas de pulpo y gula del Norte,” octopus with baby eels. 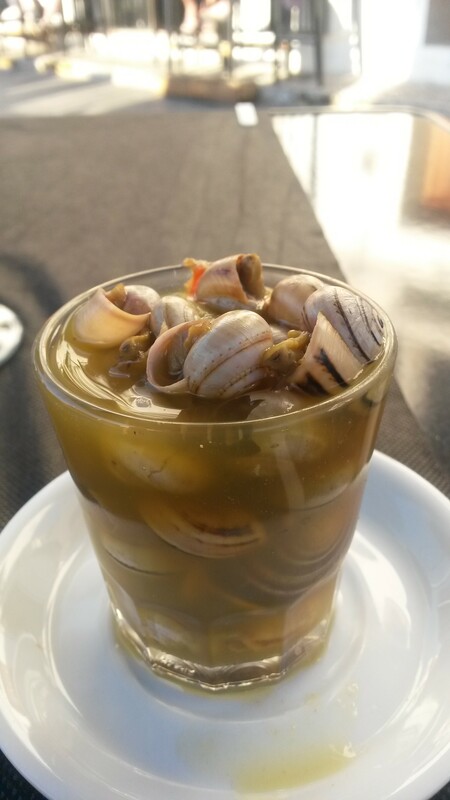 Dining in Spain is almost always a great adventure. I am an avid fish and seafood lover, and there is seldom a day that goes by when I haven’t had several of the many creatures available in the local Mediterranean waters. I am constantly trying new items from the sea including things we may have one of in California, like calamari. Here the calamari are large rings, about the size of onion rings, and often cooked by breading and frying. I find them too tough. Then there are “chopitos,” whole baby calamari with ink sacks intact, which are best when fried with a light almost-panko like crispness. Sepia is a cousin of sorts of calamari, which is larger and thicker, and is often grilled and served with a green “marinera” sauce, mariner’s sauce, not to be confused with the Italian tomato sauce, “marinara.” I have found some foods to not be worth the effort involved in trying to eat them. After a recent intense Zumba class, I went to a local tapas bar, regularly patronized by cordial smoking, drinking “abuelas” (grandmas) and their grandbabies, (and I mean no disrespect but it is very different than when I lived in San Luis Obispo county, California, where they were the first place to outlaw indoor smoking or smoking near food service.) At the café, I was told the grill had been turned off, but the fryer was working, so I ordered “patatas bravas” (spicy fried potatoes, which are not spicy if someone eats habanero sauce like I do), and fried fish. Note to self: check the type of fish before ordering. They were sardines and other equally small fish, which with my knife skills, yielded few consumable morsels. And the incredible number and quality of bivalves! Almejas (clams), berberechos (smaller clam-like content, with a scallop taste), the itsy bitsy tellinas (too much work), razor clams, mussels, oysters, gooseneck barnacles, and more. The grocery markets are filled with seemingly endless displays of fish and seafood: fresh, frozen, and canned (which are viewed as another great way to access seafood as opposed to American’s frequent opinions that canned food is of suspect quality.) 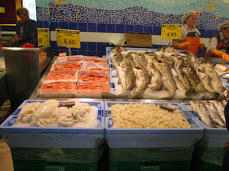 For a foodie like me, the grocery and fresh food markets are intoxicating with their fresh and novel ingredients. 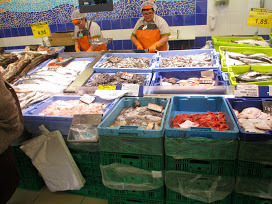 As I was photographing the vast displays of fresh fish and seafood at a regular local grocery market, Mercadona, a female fishmonger admonished me from taking more photos. So here I will include a partial sample of the store’s offerings, and the selection of frozen and canned fish and seafood is even larger. 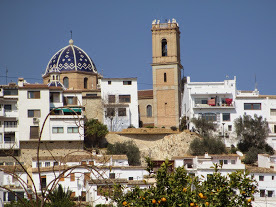 (If you read Spanish and the words don’t look familiar, that is because the official language here in the Valenciana Community is “Valenciana,” but more about that surprise to me at another time.) If you look at the trays of fresh items from the sea, it is apparent that many home cooks are adept at using fresh whole fish and other types of seafood. 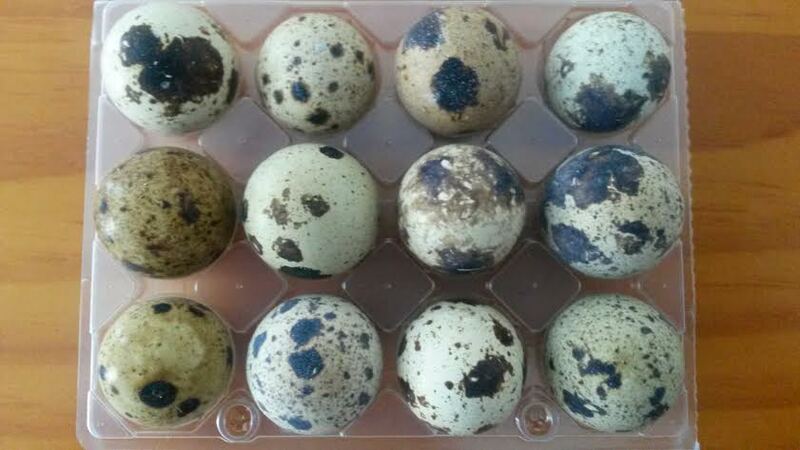 I thought I hit the jackpot when I recently walked into a local market and found a beautiful dozen little quail eggs, for 0,90 €, less than the American equivalent of $1.00. On today’s cooking television shows, they showed how to make livers with “sangre” (blood) over a fire in the hearth, and “coda de cordero,” typical recipes from other parts of Spain. The food options here are inspirational, and I am eager for my two boxes of kitchen cooking supplies to arrive here from my former home in California. Those are the only things I had shipped here, (along with a few family and travel) mementos, which speaks to my priorities. You can find my many restaurant, as well as other reviews, on Trip Advisor, as well as my map of the hundreds of places I have travelled.